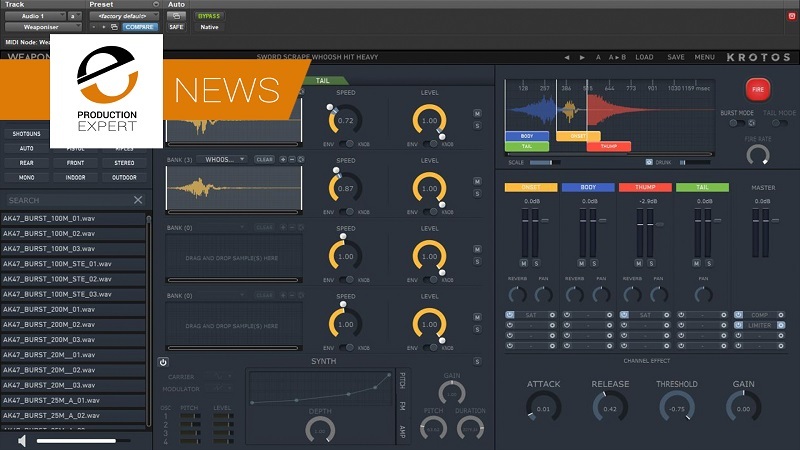 Krotos Audio, the makers of Reformer Pro and Dehumaniser, have launched their first major update to their Weapon Sound Design tool - Weaponiser, with a host of new features and presets, along with a brand new Weapon Library - The Battle Bundle. In the old version of Weaponiser, You could add speed and amplitude variation to any bank in any of the plugin’s four engines, but also load up to five samples into each bank. In V1.1.0, Krotos have added variation controls on all of Weaponiser’s synths - another 22 parameters that can shift subtly or wildly on every trigger and round, including in Burst Mode, which now also has its own variation control. Banks now have added flexibility, by being able to switch between random/round robin, per bank, and also allow Burst Mode to operate in round-robin mode, incrementing the sample files in banks per round, reducing the chance of ever hearing the exact same sound twice. Weaponiser’s mixer now includes panning per engine and a new expanded Multi-Mode EQ for each engine FX slot. Stereo waveforms are also supported in all banks and engines. 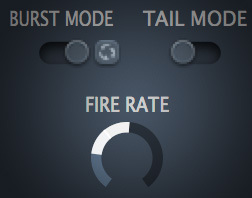 Krotos have created a dedicated ‘Tail On Release’ system, allowing a tail to be triggered on the release of the fire button or midi note, making it easier to achieve a cleaner mix or extra control over tails when in Burst Mode. They have also integrated this using ‘Tail Mode’. For example, you can use ‘Tail Mode’ to automatically set up a reload sound in the tail engine, which will be triggered every time a burst finishes. The impulse response reverb has been improved and you can now trigger a tail on the release of the fire button or midi note, allowing extra control when in Burst Modeand adding precise control of spatialisation. Providing a total of 41 new presets and 402 new assets for use in Weaponiser Fully Loaded (designed and provided for by these artists). Krotos have curated the new Battle Bundle, designed in partnership with Red Libraries and Stephan Schutze (Jurassic Park: Operation Genesis, Starship Troopers: Terran Ascendency and The Polar Express) for use with both Weaponiser Basic and Weaponiser Fully Loaded, featuring 5854 high-quality combat sounds – from sword attacks and rapiers to chainmail, shields, metal, hand-to-hand combat, body falls and impacts plus much more, providing one of the most comprehensive libraries of battle-related sounds ever recorded for TV, film and video games. Weaponiser V1.1.0 is a free update for owners of a Weaponiser Basic or Weaponiser Fully Loaded iLok license. To get Weaponiser Fully Loaded V1.1.0, customers should log-in to their Krotos account or follow the instructions in the Weaponiser Plug-In. The new Battle Bundle is available from the Krotos website and retails for £379 (ex taxes).